The storefront of Lucky's Famous Burgers on 52nd and 9th. 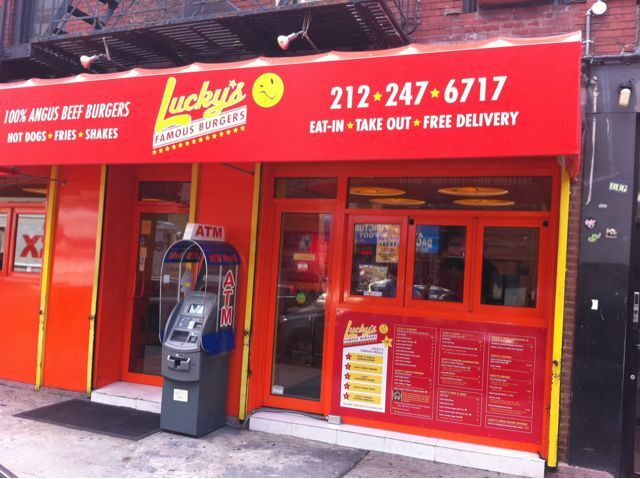 Lucky’s Famous Burgers on 52nd and 9th has been around for a while and I am well accustomed to their fare. The best thing on their menu is their amazing onion rings, which are deep fried in a gnarly, thick batter and have one hell of a crunch. They are rich, soul-satisfying and sensational. Too bad the burgers are meh and frequently overcooked. The service is also hit and miss. You can sometimes wait far too long for your order, although lately that’s been less of a problem. All that said, I’ve come to believe that the best sandwich they have on the menu is the Lucky’s Famous Chicken Sandwich. Because I am on this darn diet, and processed white flour is the enemy, I’m delighted that Lucky’s now offers their sandwiches on what they are calling a “Naked Bun,” namely a thick layer of crisp, crunchy iceberg lettuce. 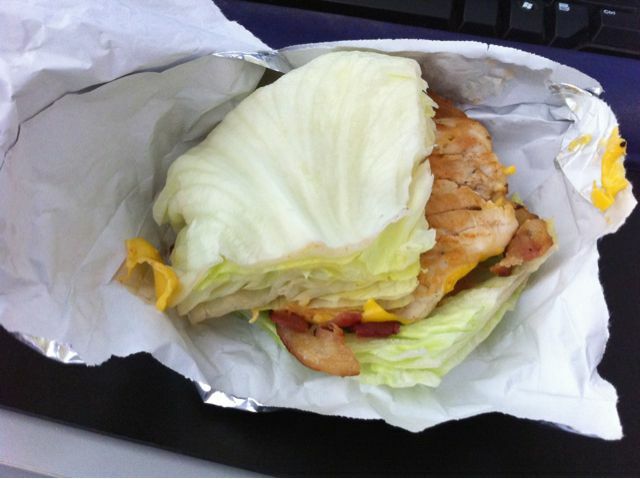 Lucky's Famous Chicken Sandwich on "naked" bun of iceberg lettuce. Appetizing, ain't it? The sandwich consists of a chicken breast, American cheese, applewood smoked bacon, lettuce (natch), tomato and Lucky’s terrific chipotle mayo. The mayo is vital to the success of the sandwich. It adds a peppery spice that illuminates the chicken breast, cheese and bacon. Your mouth will be tingling for a few minutes even after you’re done with the sandwich. 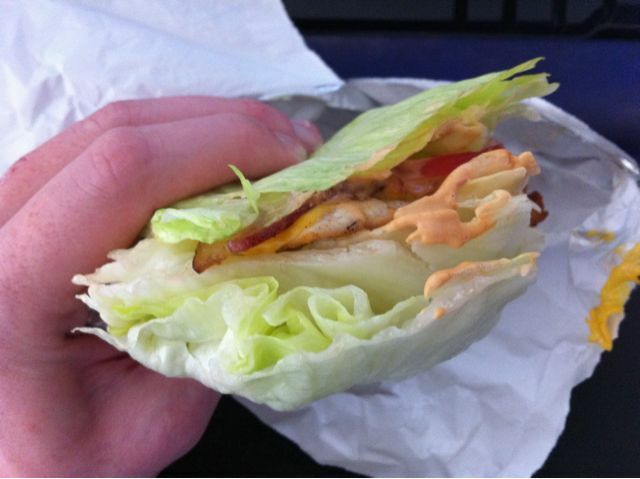 One disadvantage to the lettuce bun is it is sloppiness. While I don’t miss the carbs, sugar or other attendant evil of a bun, I do miss their ability to absorb various juices. In this configuration, my hand is invariably covered at least partially with goop amid eating. It can get somewhat slippy and gooey. I also indulged in some of the Lucky’s Sauce, which tastes a bit like a red pepper aioli with a hint of cinammon. Whatever it actually is, it’s certainly delicious. In my less-healthy days, I’d gladly dip my fries or onion rings into it (or the chipotle mayo) and enjoy. A former colleague of mine deployed the leftover sauce atop potato chips: why not? All in all, Lucky’s offers a pretty good selection, especially if you’re trying to eat with a wink and nod toward your health. Don’t kid yourself – I am sure it is not particularly healthy – but it’s certainly not as far a fall off a diet wagon as a myriad of other options.